Bohemian-Inspired Interiors -Nothing says fall like cozy knit sweaters, pumpkin spice lattes, and bohemian inspired interiors. 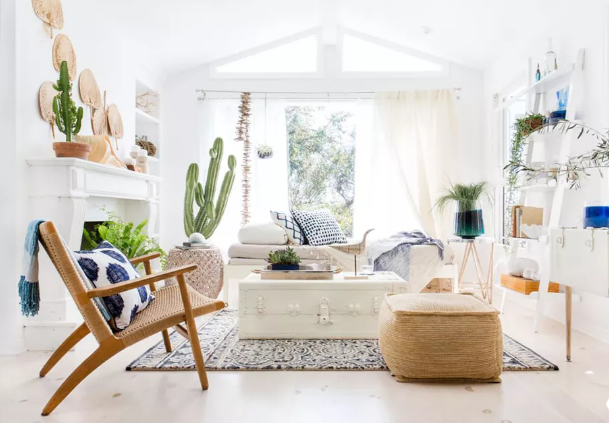 To help get you in the mood, we’ve gathered a few ways to update your home so you can thoroughly enjoy everyone’s favorite season, inside your home. Rattan Pendants-Rattan is the essential boho material with its organic, natural texture and soft tones. These pendants are easy to affix as a lamp shade to any bare bulb pendants, making them an easy update to your home. You can add them over a kitchen island, next to your bed, or over a sofa. They come in various sizes and shapes to choose from; CB2 and Pottery Barn both have good options. Pendants can be layered in a bunch to make a statement piece or just one large shade will make a nice impact on any space. Cactus Art-In case you haven’t noticed, all things cacti are having a moment. You can get all the joy out of cacti without the pain! Step One: Choose your medium. Watercolors or black and white photography are a safe bet. Step Two: Frame. Step Three: Hang! Super easy and no Bandaids needed. This Summer Cactus print from Minted is a great choice. Hanging Chair-Hang loose and carefree, the bohemian way, in a hanging rattan chair. These gorgeous chairs don’t take up any space visually as they hang effortlessly from the ceiling. Add them in cozy corners or in your outdoor space to add instant boho vibes. Dress them up in winter with a sheepskin rug or in summer with some banana leaf pillows! Woven Wall Decor-Every boho space needs one of these. Large or small, colorful or neutral, you can’t go wrong. Think of macrame as jewelry for your house; Add them over the bed or in your entry way. The woven material adds a sense of comfort while the fringe design adds a unique feel to the home. If you’re feeling ambitious, DIY! All you need is some yarn, a wood pole, scissors and some patience. Floor Seating-Adapt the bohemian lifestyle with floor seating. You can use poufs, pillows, or even bean bags. Choose stitched leather, colorful patterns, or natural materials for a loungy feel. This living space designed by Maison Trouvaille adds a bohemian vibe by ditching armchairs and adding some square poufs. By mixing and matching graphic fabrics in the same color schemes, you’ll notice the space has more layers, without looking too busy. Moroccan Throw-No need to be married to get this look. Moroccan wedding throws give a touch of luxe to the understated bohemian theme. The intricate patterns and sequins add a touch of bling in any space. Add matching pillows to complete the look!Continue to 8 of 8 below. Boho Wallpaper-Spruce up a boring wall or bland powder room with floral wallpaper for a bold bohemian update. If florals aren’t your thing, an ikat or mudcloth print works too. This gorgeous periwinkle palm wall covering is from a brilliant collaboration between the Jungalow and Hygge & West.